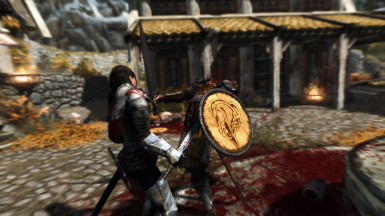 VioLens - A Killmove Mod gives you in-game control over both Ranged and Melee Killmoves. Version 2.2+ provides more Killmove Customization than ever before, allowing you to pick which Killmoves you'd like to see trigger for each weapon type and then saving/loading those picks using the Profile System. 2H Animation - Warden Combat Esp based on this, Following the default instructions by fnis didn't work so I think this is the culprit. I edited some Ids and the extracted it and made it my own, not sure if my ESP will cover those not having this. Installer version of JContainers updated to 4.1.7. Installer version of JContainers updated to 4.1.5. Fixed Stagger Pulse Toggle/Delay Timing not Saving/Loading. Installer version of JContainers updated to 4.1.3. Profile System functionality fully restored. Installer version of JContainers updated to 4.0.1. Updated files to work properly with SkyUISE and SKSE64. 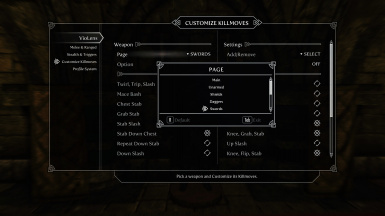 Returning Feature, Customize Killmoves: Set Killmoves to On: Customized, then head to the Customize Killmoves Menu and select Killmoves to add and remove from weapons. New Feature, Stagger Pulse: Staggers enemies nearby who witness your killmoves. New Feature, Stagger Pulse Delay: Set the timing of the Stagger Pulse. Added Back Killmoves toggle to switch between Matched and Mixed when using Customized Killmoves. Added Creature Killmoves toggle to switch between Matched and Mixed when using Customized Killmoves. Added NPC's Killmoves toggle to switch between Matched and Mixed for NPCs while You use Customized Killmoves. Separated Melee Killmove chances back into Killmoves, Dragon Killmoves, and Stealth Killmoves. Separated Ranged Killmove chances back into Killmoves and Dragon Killmoves. Added option to disable the ability to craft the VioLens Book at the leather rack. Fixed an issue with Sabre Cat killmoves where a third person only animation would trigger the first person camera, causing the camera to lock in place for the duration of the killmove. Removed the "Not Detected" requirement from Stealth Killmoves. Resorted the masters in the VioLens SE - Book Menu plugin to the correct order. Removed the book from Dragonsreach, book is now added automatically to your inventory. If that fails for some reason, the book can also be crafted at the tanning rack. Book will not show up to craft if it is already in your inventory. Decapitation choices added to the book menu, Off/Perks/On. Advancing Killmoves choices added to the Modes section of the book menu, Off/Last Enemy/On. Seated Killmoves choices added to the Modes section of the book menu, On/Off. Defaults button added to the book menu that will reset all of the settings. VioLens book now has a description of every feature in the config menu, simply exit the config menu to read the actual book. Initial Release. Version 2.11 converted to Special Edtion. Due to there being no SkyUI, added a book menu patch to hold us over. Staggers enemies nearby who witness your killmoves. Set the timing of the Stagger Pulse. As of Version 2.2, VioLens SE allows you to save and load not only your Menu Settings, but also your Customized Killmoves settings from the Profile System Page. Menu Settings will be saved to Data/Killmove Mod Profiles/VioLens/Menu Settings with the extension .VLMS, and Customize Killmove settings will be saved to Data/Killmove Mod Profiles/VioLens/Customize Killmoves with the extension .VLCK. The Profile System page will also display the currently loaded Profile as well as the number of profiles detected. 3 optional premade Customize Killmoves Profiles are included. The Profile System requires JContainers SE to work and has been included as an option in the main download file's fomod installer. VioLens can go anywhere in your load order. 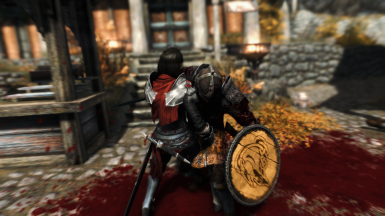 If you have any mods that happen to edit killmoves, then VioLens should usually go below said mods. 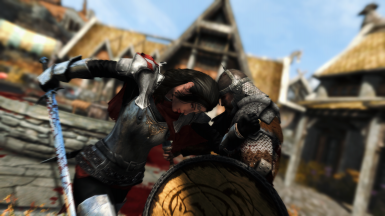 Q1: How is VioLens different from other killmove mods? A1: There are 3 main things completely unique to VioLens. Q6: Why are there two different settings for Ranged Killmoves? 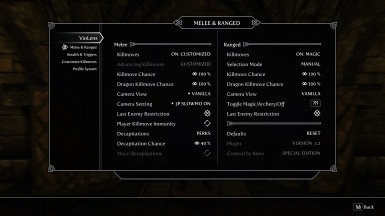 A6: There are two different settings for Ranged Killmoves instead of just an On/Off Toggle because of the way Skyrim handles Magic Killmoves vs Archery Killmoves. When the .ini setting bVATSIgnoreProjectileTest is set to 0, Magic Killmoves will play more consistently and Archery Killmoves will play less consistently. When bVATSIgnoreProjectileTest is set to 1, Archery Killmoves will play more consistently, but Magic Killmoves will rarely ever play. VioLens can switch between these settings for you if you set the Selection Mode to Automatic. Q7: Why do Ranged Killmoves play even when I didn't kill my target, or even worse, when I miss? 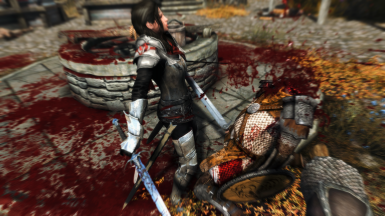 A7: This is just the way Ranged Killmoves work in Skyrim. They weren't implemented very well, and as a result, you might get Ranged Killmoves when you shouldn't. Q8: Why doesn't Killmove Chance 100% mean 100%?! 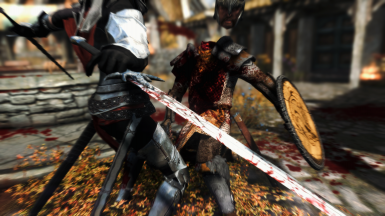 A8: Killmoves can be fickle because of the odd way they're implemented into Skyrim. For Melee Killmoves, if you want to see as many killmoves as possible, you need to turn Last Enemy Restriction off, be on even terrain, be positioned in front or behind your target correctly, and be aiming right at your target. For Ranged Killmoves, it's the same deal with Last Enemy Restriction, but they are overall less consistent and "Quirky" than Melee Killmoves and may not always trigger when they should. A9: VATS or V.A.T.S. stands for Vault-Tec Assisted Targeting System. 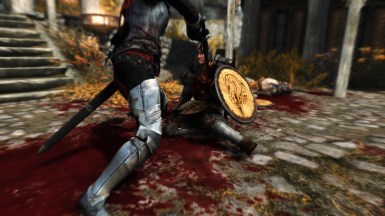 Skyrim uses a modified version of the Fallout 3 engine, so the Ranged Killmoves they've implemented as well as the Cinematic Cameras used for Melee Killmoves are a part of what's left over from VATS. 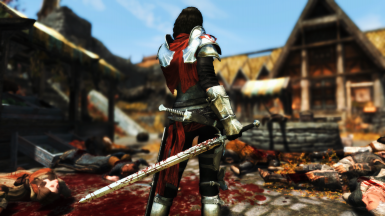 VioLens allows you to disable VATS in-game via the MCM, which turns off any Cinematic Cameras and Ranged Cameras in the game. 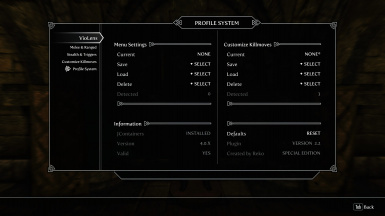 This option in the MCM toggles the bVATSDisable setting in the Skyrim.ini file between 0 and 1. If you've added this line to your Skyrim.ini file, it will be overwritten by VioLens' MCM toggle. 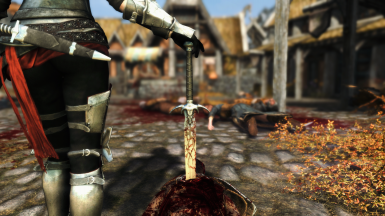 You do not have to remove or add this line to your Skyrim.ini file, VioLens will take care of it. Q10: Why does the Sleeper Hold Killmove Camera linger for so long? A10: The standard 3rd Person Camera for it is a bit broken, but if you're using the 3rd Person Static Camera, or have VATS disabled, you shouldn't run into this problem. If you don't want to use those options, then I'd suggest not using the Killmove at all if it bothers you. Nope, I can't fix it. Q11: What's the deal with "Seated Killmoves"? A11: This option lets you perform Stealth Killmoves on NPCs that are sitting on stuff. It's possible that performing a killmove on a sitting NPC may cause their body to get stuck in whatever they were sitting on or the positioning of the killmove may be off. Q12: Why isn't VioLens showing up in the Mod Configuration Menu? How do I get it to show up? A12: It's just taking longer than usual, try waiting a few hours using the in-game wait feature. If that doesn't work, open the console in-game with ~ and type setstage SKI_ConfigManagerInstance 1. Q13: Why does everything have a $ infront of it in the MCM? 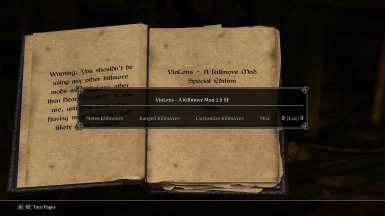 A13: If you're seeing $ infront of things in the MCM, you either don't have the VioLens SE_ENGLISH.txt installed, or your Skyrim isn't in English. If it's the former make sure the VioLens SE_ENGLISH.txt is placed in the Data\Interface\Translations Folder. If it's the latter, either download your language from the optional files or, if your language isn't available, rename the VioLens SE_ENGLISH.txt to the correct language until your language becomes available. Q14: Which should I choose "Loose" or "BSA"? A14: When it comes to VioLens, there shouldn't be any difference between the two, it's up to you how you want your files arranged and placed. Q15: Why is the Ranged Section of the MCM greyed out? A15: The Ranged Section is greyed out for 1 of 2 reasons. Q16: How do I trigger Stealth Killmoves? A16: Stealth Killmoves work the same way as normal killmoves, they play when you actually kill your target. This is a little more difficult with stealth because it means your weapon has to be strong enough to 1 shot your enemy. 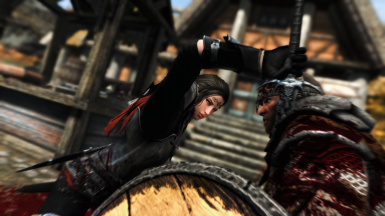 It should also be noted that the Neck/Sleeperhold killmoves can be a bit inconsistent, which may be why they were not used at all in the vanilla game. 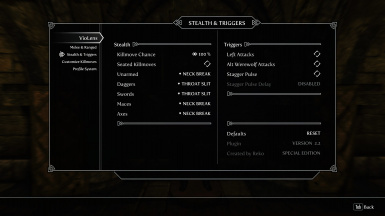 If you're having problems triggering stealth killmoves, try setting them to Throat Slit only as it is the most consistent stealth killmove. 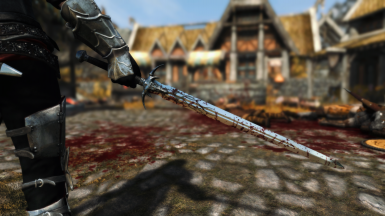 Q17: How many killmoves does this mod have compared to any other killmove mod? A17: VioLens makes use of every single killmove in the game with the exception of the "Heart Breaker" Killmove. 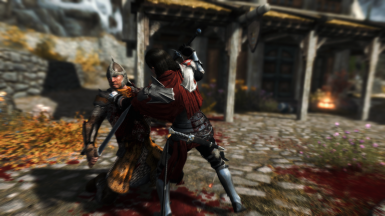 There should be no killmoves present in other killmove mods that are not present in VioLens. Q18: VioLens is overwriting some files added by another mod, what should I do? A18: VioLens now includes 2 extra things for the profile system to work, JContainers SE and UILib Version 1. These are resource files that may also be included with other mods. In the case of UILib, it doesn't matter which mod's UILib files are overwriting the other one's, they should be identical. For JContainers64, VioLens comes bundled with version 4.1.7, which is the latest version at the time of 2.21b's release. As long as your installed version of JContainers SE is version 4.1.x or higher, it should work with VioLens.